Six strands of beautiful pink shell 18" necklace with silver catch stamped Japan. Big turquoise and tan mother of pearl shell beads, 36" necklace with silver catch. Great looking 18" necklace with coral mother of pearl shell beads and gold accent beads. seed beads and white stone beads. Wonderful, tropical big shell necklace . Heishe bead, sea shell and coral bead 18" necklace. Well made in excellent condition. Brown and white 17" heishe bead choker necklace. White 17" heishe bead choker necklace. Far out big heishe bead 20"necklace, accented with tie dyed glass beads. Another far out 14" large heishe bead necklace with agate pendant. 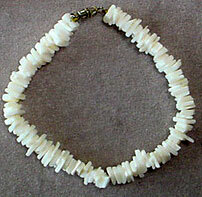 Large shell chip bead 18" necklace. Chipped shell bead 14" choker necklace in excellent condition. Oaxaca, Mexico hand made 26" clay beads necklace. Hand crafted clay bead 14" necklace.